Alade Aminu came back to earth after his outstanding first Showcase game, scoring just 11 points on 5-10 shooting while grabbing an unimpressive 2 rebounds in 23 minutes. Aminu was also in foul trouble, finishing the game with 5 fouls, and this game definitely shed some light on his unimpressive averages (10 points, 5 rebounds) throughout the season. Aminu's biggest problems right now lie in his inconsistency on defense and the glass, as he doesn't always rebound the way he's capable of, and he tends to get lost at times on defense. He had quite a few instances today where he was indecisive defending pick-and-rolls, leading to openings for the opposition or putting him in a position where he was forced to foul. The encouraging thing is at times Aminu looks great in these situations, as he clearly has the tools to be a versatile defender with his mobility and length. Offensively, Aminu also has some problems, as his post game is not very reliable as of yet, even though he shows nice flashes. According to Synergy Sports Technology, Aminu is scoring just 0.75 points per possessions on post-ups, which make up the largest portion of his offensive usage. In watching him play, it's clear he's a bit lacking in instincts here, and can tend to force the issue at times. That said, his hook shot looks very good at times, as he gets great separation and his touch isn't bad. Aminu is at his best finishing off cuts and pick-and-rolls, two situations he probably isn't used in as often as he should be. If he focused on those two aspects alone, while also developing a bit more consistency with his mid-range jumper (which is already respectable), he could be a nice role playing big in the NBA, assuming he improves his defense and rebounding. Possibly the player with the most upside of any player in the D-League, Aminu should be getting looks for call-ups soon, as he's a low-risk option to stash on a roster and develop. That said, with the economic constraints placed on many teams (there's a reason many teams are opting to use only 13 of 15 potential roster spots), his list of potential suitors is definitely smaller than it would be normally, so it's no guarantee he finds a home before the season ends, especially because it's questionable if he could immediately contribute if forced into action. Alade Aminu had arguably the best performance of any player in the Showcase thus far, putting up 30 points and 23 rebounds, flashing some serious upside along the way. Weve clearly been much higher on him than pretty much anyone else since the first time we seriously evaluated him at Portsmouth last year, and he did nothing to dissuade us with his play today. Aminu is intriguing thanks to his terrific size, length, hands and solid athleticism, and obviously has a great deal of upside to continue to tap into as well. With that said, most of the NBA scouts we talked to following this game sounded fairly skeptical about fully jumping on the Aminu bandwagon, citing his lack of productivity on the season (10 points, 5 rebounds per game) thus far. Well have to see if Aminu can manage to quell those doubts tomorrow with another strong showing. Weve yet to see a better long-term NBA prospect in Boise thus far. Alade Aminu might be the top overall prospect in the D-League, especially from a long-term perspective. The team went out and acquired him via trade, and may be able to develop him into a dominant Courtney Sims type presence as the season moves on. 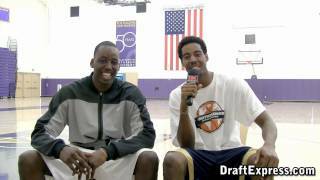 Aminu has NBA size, length and athleticism, even if he needs to add some bulk to his frame. He shows nice potential facing the basket and is a very intelligent guy off the court reportedly. Hes definitely a name to keep in mind. Alade Aminu continued to impress by scoring 13 points along with 10 rebounds and 2 blocks, showing very smooth athleticism for a player his size. Aminu excels at setting screens on the perimeter and quickly rolling to the basket to get open for the score, taking advantage of his mobility and good hands. He also has a nice right-handed hook shot on the block and is pretty patient not to force the issue, resetting to the perimeter when nothing is there. When motivated, he runs the floor exceptionally well, often beating his man down the court. On the defensive end, Aminu made a few blocks rotating over in the lane, but his overall defensive game could still use some work in awareness, toughness and fundamentals. Still, hes clearly one of the more upside-laden players at this tournament, and has likely helped his stock just by being out on the floor.